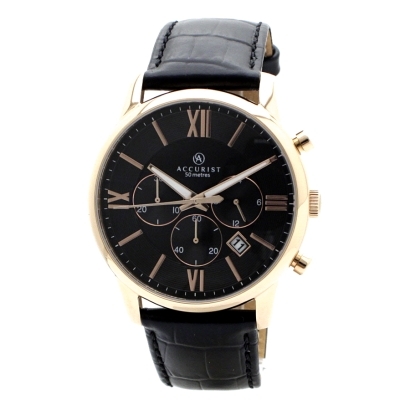 Accurist 7095 is an amazing and special Gents watch. Case material is PVD Gold plated and the Bronze dial gives the watch that unique look. The features of the watch include (among others) a chronograph and date function. This model has got 50 metres water resistancy - it can be submerged in water for periods, so can be used for swimming and fishing. It is not reccomended for high impact water sports. The watch is shipped with an original box and a guarantee from the manufacturer. Extremely stylish watch and superb minimalist design. Slightly rose gold tint to it but not too much to make it look like it could possibly be a female watch. High quality leather strap, metal buckle slightly wares after some time but that is to be expected with any watch.